ISIS Pharmaceuticals, Inc. (NASDAQ:ISIS) appears to be trending in the right direction again after a sharp decline earlier this year. The drug company, of cholesterol drug Kynamro fame, had buckled under the disappointing sales of their leading product, but a vast product pipeline is once again winning out with investors. Jim Cramer praised them for their strong momentum on CNBC today. “Isis is, I think, just an unbelievable company, and people have to recognize that, well I was going over a bunch of them last night, but I just like that company so much. 31 different drugs on the horizon, really really terrific. Acadia, we got Parkinson’s another one, but Isis is the one that I think has the real momentum […],” Cramer said. Included among that massive drug pipeline, which ISIS Pharmaceuticals, Inc. (NASDAQ:ISIS) lists as being 34 strong, are five different drugs in phase 3 clinical testing, approaching potential approval and release to the market. Among them is a cancer drug that inhibits the production of Clusterin, a cell-survival protein that activates in response to cancer treatments, limiting their effectiveness, as well as drugs to treat spinal muscular atrophy, and a therapy for Familial Chylomicronemia Syndrome. 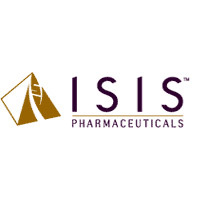 ISIS Pharmaceuticals, Inc. (NASDAQ:ISIS) has recently had to address the unfortunate issue of sharing the same name as the infamous terrorist organization. While other companies have made moves away from the name, including the ISIS Wallet payment app, which is now called Softcard, 25-year-old ISIS Pharmaceuticals, Inc. (NASDAQ:ISIS) has determined to retain their name. As they don’t deal directly with the public, name image isn’t expected to have any adverse effect on their business, like it may have with the aforementioned company. While ISIS Pharmaceuticals, Inc. (NASDAQ:ISIS) is only up 4.29% year-to-date, they have rebounded strongly from a sharp decline in the first half of the year, after a meteoric rise of more than 500% from the start of last year until February of this one. They are up 28.88% over the past three months, and over 8% this week alone. They are currently trading at $41.69 in afternoon trading.